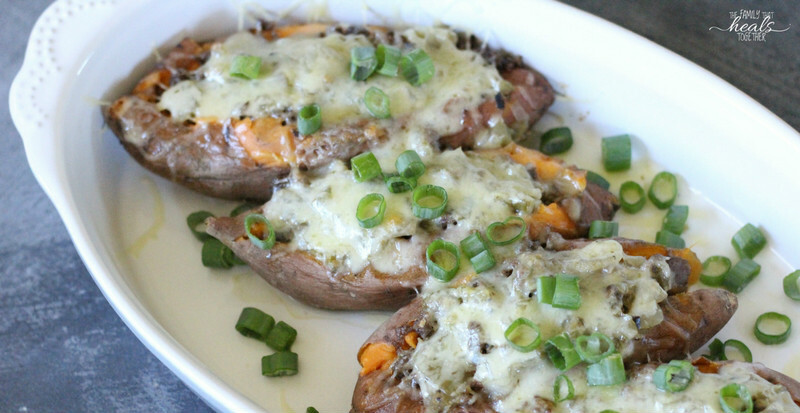 The idea for these enchilada stuffed sweet potatoes came from the same place all my food inspirations do: hunger. And the desire to have healthy food to eat with very little time or effort. Our day was all screwy today because I slept in til 10. Oops. A dear friend came over to keep me company last night and we chatted until somewhere around 2:30 or 3 this morning. And it was stupid and it was worth it. Because girlfriends. So then it was free-for-all and my kids ate whatever they found for breakfast, then my oldest made a batch of muffins for a late morning snack and then it was nap time. But while my littles were snoozing or playing quietly in their rooms sneaking out of their rooms to wreak havoc every five minutes, I started to get really hungry. I broke into my stash of secret cookies (no crying in my closet, just good, old fashioned indulgence on the sly), but that didn’t hold me over for long. I remembered the sweet potatoes I’d put in the Instant Pot earlier in the morning because I wisely knew I’d need something easy to eat while I was dragging through the day (still worth the soul-nourishing time spent with my friend!). I also remembered I had a small bowl of browned hamburger meat and a jar of salsa verde somewhere in the back of the pantry. Boom. Late lunch/early dinner/whatever was ready to eat in five minutes. While our family is in this weird transition pre-move and having to show our house while it’s on the market and going through a general cruddy period of major adjustment, my commitment to eating as well as we’re used to has waned. But I really did decide that I was ready to get back on the horse and do my very best to nourish us with our normal healthy fare. 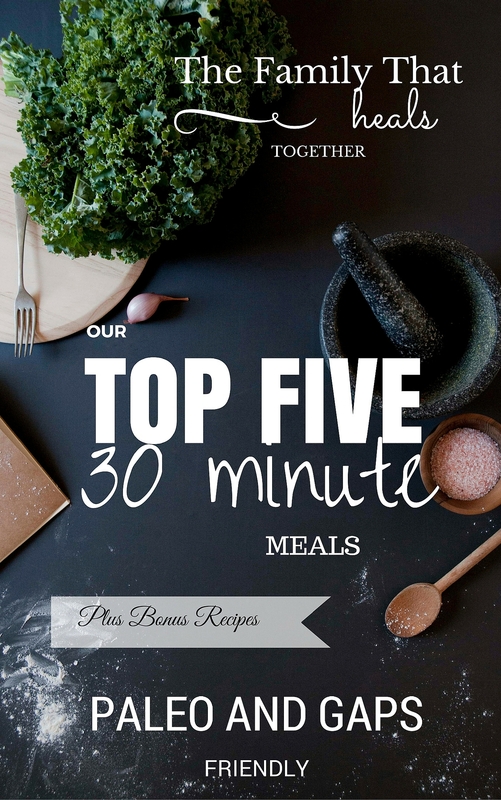 I meal planned the simplest of menus, but kept it paleo, and it was easier than I expected. I prepared a breakfast casserole the night before the showings with eggs from our backyard hens, sausage, onions, green chilis, and cheese and we all loved it. I made two loaves of paleo banana bread Sunday night that we ate over the last few days and it was awesome. We made my 10 minute oven-cooked lemon thyme salmon and I felt so nourished with truly minimal effort. And I set aside that left over browned hamburger meat from earlier in the week and used my Instant Pot nearly every day. So now, I’m working on making Sundays my prep day, even if I just make some bread and a casserole. If you have a busy schedule and aren’t home much to cook during the week, I suggest browning a couple pounds of hamburger meat, baking some sweet potatoes, and chopping some veggies for the week ahead. Just a little planning will go a long way. 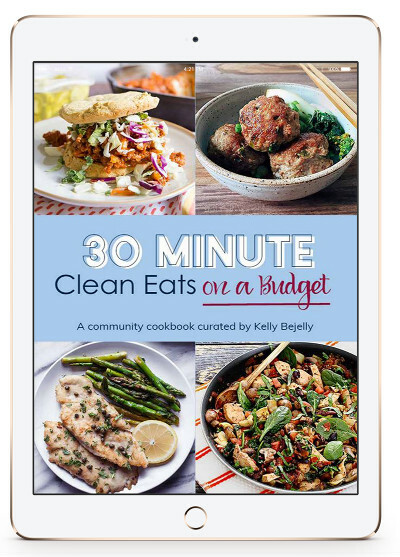 Check out the new e-book 30 Minute Clean Eats on a Budget, a cookbook featuring recipes from some top paleo bloggers (and even a few of my own!). You can check it out here. 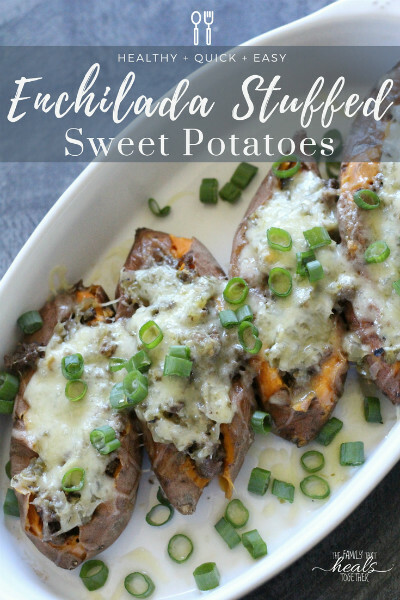 For another quick, easy, healthy meal you can get on the table in no time, grab the recipe for Enchilada Stuffed Sweet Potatoes below. Cut each sweet potato in half lengthwise, leaving the bottom intact. Scoop about 1/2 cup hamburger meat in each sweet potato. Top the hamburger meat with desired amount of salsa verde. Place under broiler for 5 minutes, then, if using cheese, turn broiler on high and cook 1-2 minutes longer to brown the cheese before removing. Top with guacamole, sour cream, fresh chopped green onions, and cilantro, if desired. I’m so bummed, but just for me, not for you and your family! I can’t eat nightshades, nor dairy. But this sounds delicious!! (the enchiladas).